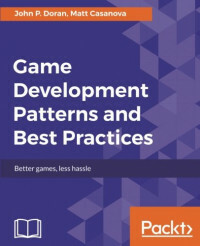 If you are a game developer who wants to solve commonly-encountered issues or have some way to communicate to other developers in a standardized format, then this book is for you. Knowledge of basic game programming principles and C++ programming is assumed. You've learned how to program, and you've probably created some simple games at some point, but now you want to build larger projects and find out how to resolve your problems. So instead of a coder, you might now want to think like a game developer or software engineer. To organize your code well, you need certain tools to do so, and that's what this book is all about. You will learn techniques to code quickly and correctly, while ensuring your code is modular and easily understandable. To begin, we will start with the core game programming patterns, but not the usual way. We will take the use case strategy with this book. We will take an AAA standard game and show you the hurdles at multiple stages of development. Similarly, various use cases are used to showcase other patterns such as the adapter pattern, prototype pattern, flyweight pattern, and observer pattern. Lastly, we'll go over some tips and tricks on how to refactor your code to remove common code smells and make it easier for others to work with you. By the end of the book you will be proficient in using the most popular and frequently used patterns with the best practices. This book takes a step-by-step real-life case studies approach. Every pattern is first explained using a bottleneck. We will show you a problem in your everyday workflow, and then introduce you to the pattern, and show you how the pattern will resolve the situation.